The class of 2019 is heading into the final stages of with the first signing period coming up next month. After that while they’ll still be a number of quality prospects on the table the focus will shift to securing spring commitments or paying closer attention to some late blooming prospects. One talented senior who has remained in the top 50-75 national conversation and who’s still collecting offers is Michigan native Harlond Beverly. A two time NY2LA Sports Futures Camp MVP and an NY2LA Basketball Association standout with the R.E.A.C.H. 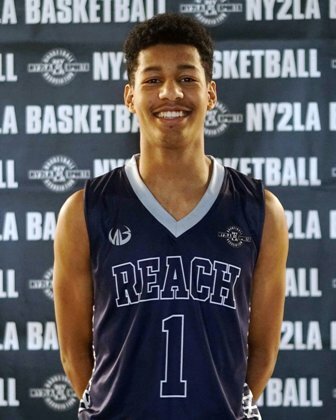 Legends, the 6-4 170 pound Beverly is attending Montverde Academy in Florida this season and he’s continuing to see high major schools jump on his recruiting trail. At his best Beverly is a silky smooth wing with an ability to impact the game in a variety of ways. He’s athletic, skilled, and instinctive allowing him to pose a threat both offensively and defensively for opposing teams. He can score in transition, finish through traffic, and he has the ability to score off the bounce by attacking the rim or ripping the nets at the mid-range area. His jumper is smooth with range so coming off screens or in the catch and shoot capacity on the break are areas he can excel as well. On the defensive end of the floor Beverly’s length, athleticism, and instincts give him solid potential. He can defend multiple positions and he’s shown an ability to jump the passing lanes for steals leading to transition buckets. Not a fully developed prospect on the defensive end at this stage, Beverly has a nice ceiling there big picture wise when he completely dials in. Still developing physically, Beverly’s best years lie ahead and high major programs from across the country continue to take notice. Baylor, Michigan State, Xavier, Indiana, Creighton, DePaul, Florida, Louisville, Minnesota, Missouri, Nebraska, Ohio State, Toledo, Arizona State, Texas, Northwestern, and Georgia have offered. With neither have offered to date, Wisconsin and Michigan have also expressed interested in the talented wing. A big versatile guard with a high ceiling long term, look for Beverly to take another huge step forward this season in the Montverde uniform and whomever lands the talented guard could be getting a high major impact talent that some high majors will regret sleeping on. As indicated Beverly played with the R.E.A.C.H. Legends during the grassroots travel season.